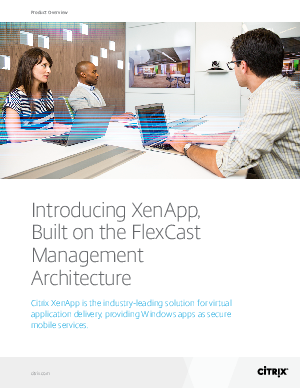 Citrix XenApp delivers Windows apps as secure mobile services. With XenApp, IT can mobilize the business - increasing user productivity, while reducing costs by centralizing control and security of intellectual property. XenApp delivers high-performance access to Windows apps from any PC, Mac, laptop, tablet or smartphone by providing a mobile workspace experience that rivals a native app. XenApp is built on the 3rd generation of the FlexCast Management Architecture (FMA), a cloud-ready platform that separates the management plane from the workload thereby increasing scalability, simplifying security, and automating the delivery of virtual applications.